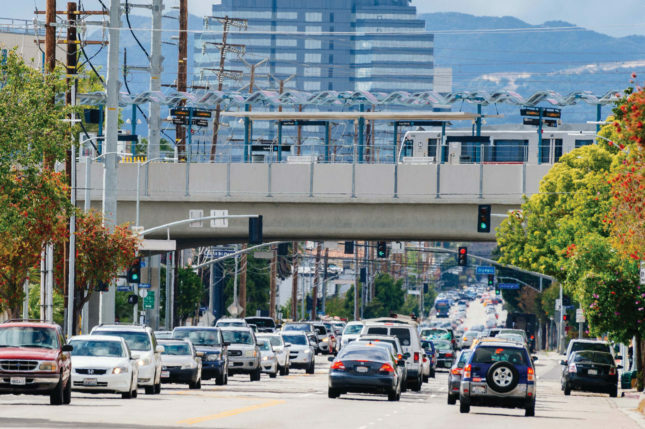 How does the design of Los Angele's Expo Line stack up? - Archpaper.com How does the design of Los Angele's Expo Line stack up? 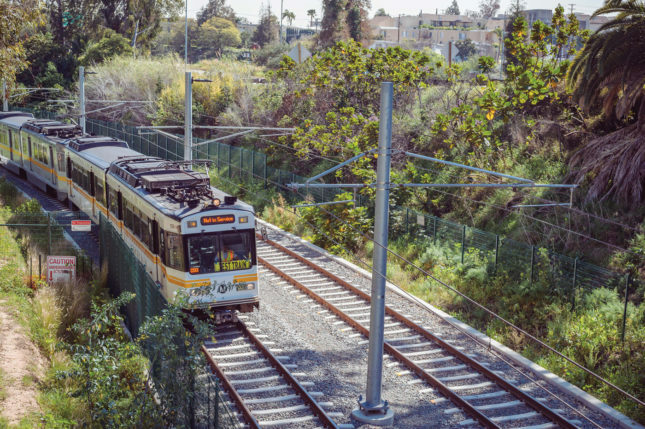 How does the design of Los Angeles’s new Expo Line stack up? 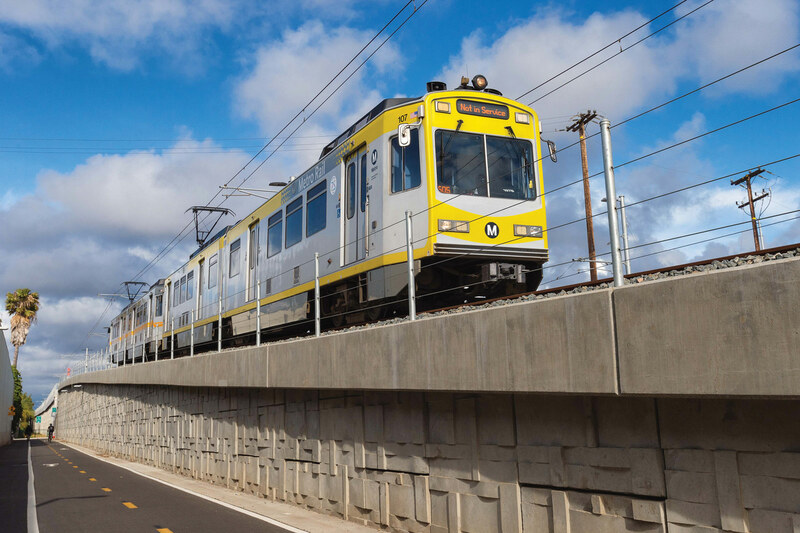 The L.A. County Metropolitan Transportation Authority (Metro) has finally rebuilt one of L.A’s original commuter streetcar lines: The Expo line, a 15.2-mile long appendage that will link Downtown Los Angeles to Santa Monica. Completion of the $2.5 billion route marks an important milestone for the region’s maturing 25-year-old rapid transit system. The lead architectural and urban design was by Gruen Associates who, with planning and design firm RAW International, crafted the system’s transit stops; Parsons Brinckerhoff carried out overall planning; and Skanska spearheaded construction. 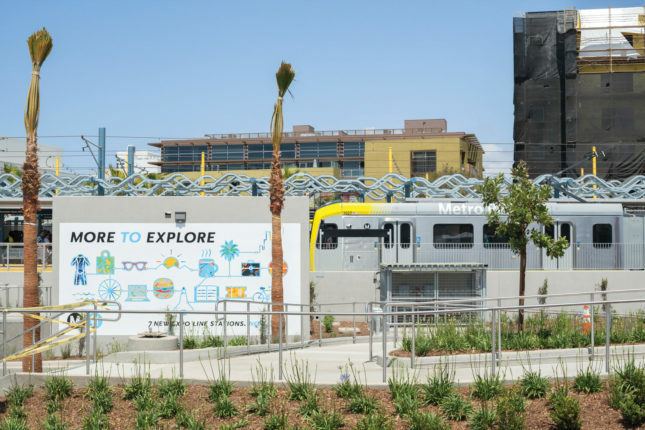 The Expo line is the transit agency’s latest effort to weave light rail travel into a growing, multimodal web of mobility options available to Angelenos—it is as much a new way to see Los Angeles as it is a train. While the system’s 1990s-era subway stations play fast and loose with decorative schemes—from massive boulders at Beverly and Vermont to highly polished kitsch at the Hollywood and Vine and Chinatown stops—Expo stations are subdued. Mostly located at-grade and topped by a half-hexagonal mop of ocean wave–inspired, perforated aluminum panels supported by a sinuous, pale-blue, crisscrossing armature, the stations try hard to be poetically mundane. 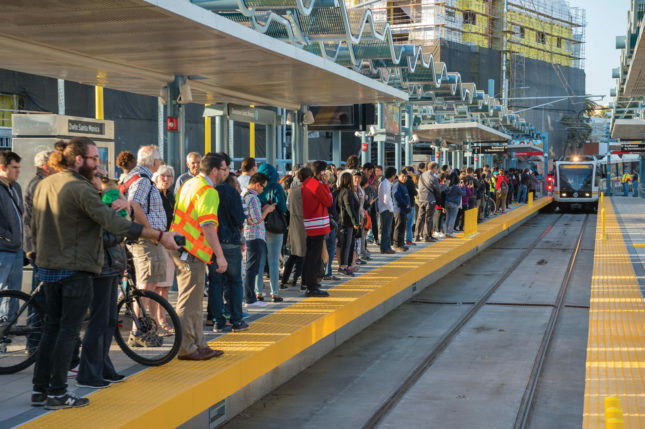 A product of tight budgets, the line’s many at-grade crossings and stations result in a crude and dangerous construct: Drivers are forced to acknowledge light rail trains and passengers as a legitimate urban presence through their sheer occupation of the street. This condition could benefit from a more aggressive transformation of the intersections and sidewalks leading up to each station: Introducing simple elements like bollards, contrasting paving strategies, and other speed mitigating measures would do much to improve what should be nodes of pedestrian activity. Stations between Downtown L.A. and the University of Southern California campus are easily approached from the street via handicap ramps and feature no-frills signage. The concourses are, again, simple in their articulation, with a smattering of concrete and aluminum benches. These stations are earnest attempts at creating planted flags in what might one day be a larger, more prototypically pedestrian urban expanse. The empty storefronts along many of the tacky, faux-Italianate perimeter block apartment complexes in the area, while highlighted by the stations’ electric bolt silhouette, have yet to benefit from the line’s booming ridership. As of now, these stops are desolate, quite a few gentrification waves away from being viable transit-oriented developments. At-grade stops between USC and Culver City are also unsuccessful as stations, with complicated tangles of pedestrians, trains, and drivers. The elevated stations further west, however, like those at Culver City, La Cienega, and Bundy, announce themselves from a distance as a new type of elevated object in the Southern California sky. Less majestic than Chicago’s industrial-era L stations, the elevated Expo stops gently appropriate the language of freeway vernacular, subverting the typical L.A. overpass by co-locating a landscaped bicycle path and potentially, future stations for the system’s new bike share program, along the length of most of the line. These areas are straightforwardly open spaces; the overhead bridges’ weights reach the ground via four discrete and compact piers, leaving room for drop off and transfer areas. 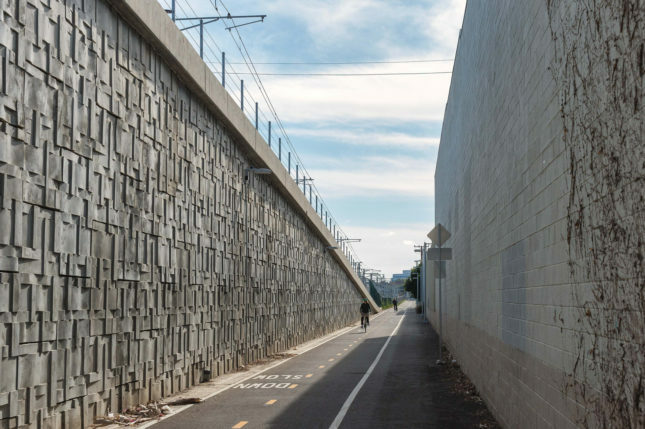 Large concrete walls designed in great relief, populated with complex, pixelated geometric motifs and lushly planted with drought-tolerant flora line the bike path itself. Instead of dank, unwelcoming troll bridges like those associated with the freeways, Expo’s overhead crossings are places for collective movement, an aspect exemplified by their minimal treatment and the location of a variety of specially-commissioned art installations at each stop. Riders ascend via elevators and stairways to reach the platforms that provide molehills from which to gaze out over the city’s flatlands. But, because one is walking—and waiting—instead of driving, the effect is potentially one of true introspection. The western terminus at Santa Monica is also a fundamentally pedestrian urban gesture. The station is built as an elevated plaza that cascades to the north in a broad set of stairs, funneling travelers toward major pedestrian shopping areas and into the intersection of Colorado Boulevard and Ocean Avenue, redesigned as a massive diagonal crossing intersection. Here, the intersection is striped with massive white bands of paint in a strangely fitting plaza and civic space for Los Angeles. If it is indeed Metro’s goal to normalize multi-modal transit in Los Angeles, then the Expo train, with a few tweaks, is a good template for what the rest of the region’s rapid transit system might look like in the future. Expo’s design and existence is an unexpectedly powerful, if somewhat work-in-progress expression on behalf of transit-mixed streets.